We address the problem of sampling signals which are comprised of pulse streams. This model is prevalent in applications such as bio-imaging, neuronal activity and ultra-wideband communication. Pulse streams can viewed as parametric signals, which are defined by the pulses delays and amplitudes. Following this point of view, it was suggested that the minimal sampling rate for such a model, is the number of degrees of freedom per unit of time, referred to as the rate of innovation. Although sub-Nyquist schemes for pulse streams were proposed in various works, either the rate of innovation was not achieved, or the pulse shape was limited to Diracs. In addition, several of the methods are unstable in the presence of noise. In this work we present a new sub-Nyquist architecture, which operate at the minimal sampling rate, support general pulse shapes and exhibit high noise robustness. The model treated here is related to the one used in the multipath medium identification problem, however there are two fundamental differences between the models, which lead to different sampling strategies. The first is that in contrast to the previous setting, the unknown delays vary from period to period. Second, here we require that the pulses have finite time support, and that pulses from one period do not interfere with other periods. Under this assumption, which is not required in the previous model, each period of the signal can be processed separately. The advantages over the previous scheme is that it supports varying delays from period to period, and as we show next it requires a simpler digital correction stage. The advantages of the previous method are that it can treat pulses with infinite time support and that it includes also single channel configurations. We consider a signal comprised of an infinite number of delayed and weighted pulses. It is assumed that in each time interval T there are L pulses. Since each pulse is defined by 2 parameters - delay and amplitude, in each interval there are 2L degrees of freedom. Therefore the rate of innovation of the signal is 2L/T. Our aim is to develop a sampling and reconstruction method operating at this rate. 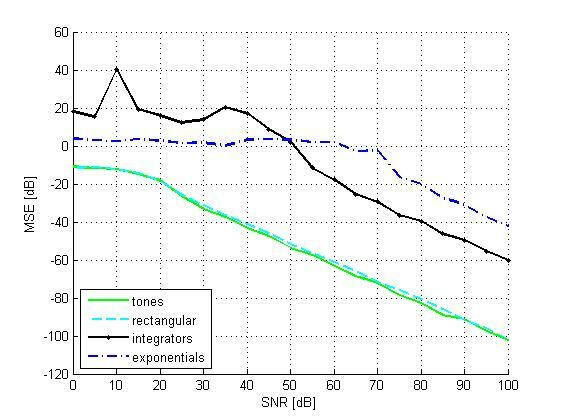 Filtered rectangular pulses modulated by ±1. 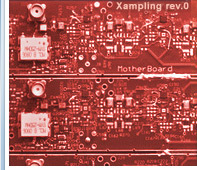 These waveform can be generated by the Modulated Wideband Converter. Cosine and Sine functions with multiples of a basic frequency of 1/T (tones). It was shown in  that each sample at the output of the multichannel scheme, is composed of a linear combination of the signal's Fourier coefficients. 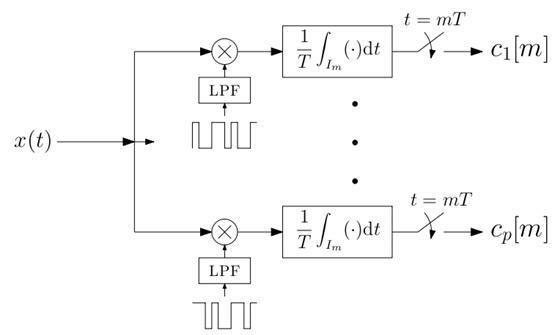 By proper design of the modulating waveforms, a set of 2L Fourier coefficients can be extracted from the samples. Once the Fourier coefficients are given the unknown delays can be recovered using standard methods for model-based complex sinusoids estimation, such as the annihilating filter, matrix pencil and more. See  for further details. 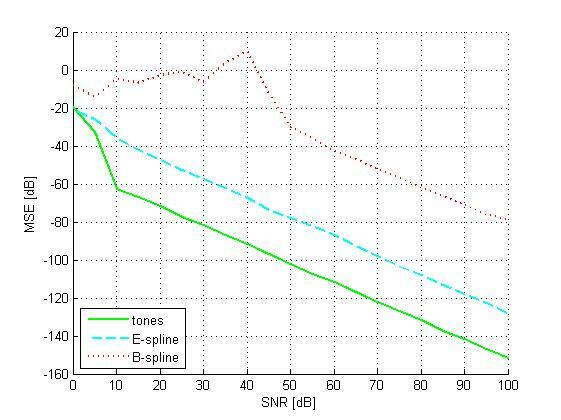 In order to perfectly recover the delays and amplitudes, the number of sampling channels has to be greater or equal to 2L, leading to a minimal sampling rate of 2L/T. This rate equals to the signal's rate of innovation, which is the minimal rate for such models. We demonstrate the performance of our approach in the presence of white Gaussian noise when working at the rate of innovation. We compare our results to those achieved by the integrators and exponential filters based methods. The MSE as function of SNR for L=2 Diracs per period and sampling rate of 5/T is depicted below. The plot shows that the two configurations supported by our scheme (tones and rectangular pulses) outperform the previous methods. Next, we compare our method to the E-spline and B-splines methods. These methods require a sampling rate of 64/T, for L=4 pulses per period. The results are shown in the graph below. It can be shown that our approach is also more robust than the ones based on splines, in addition to its lower sampling rate requirement. K. Gedalyahu, R. Tur and Y. C. Eldar, "Multichannel Sampling of Pulse Streams at the Rate of Innovation", IEEE Trans. on Signal Processing, vol. 59, no. 4, pp. 1491-1504, Apr. 2011. Download a Matlab package implementing the proposed method. 1. Use MultiSampMix.m to perform sampling of Diracs with the proposed method. 2. Use MultiRecoverMix.m to perform recovery of the Diracs delays from the samples, where noise can be added to the samples prior to the recovery stage. 3. For more information on the functions usage, see MultiFRI.docx.